S. 2713 SEC. 4. 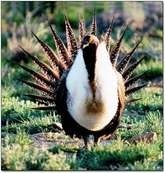 PROTECTION AND RECOVERY OF GREATER SAGE-GROUSE. All this taxpayer expence for a bird. Greater Sage Grouse public land issue could close access to hundreds of collecting sites in the States of Washington, Oregon, California, Idaho, Nevada, Montana, Wyoming, Colorado, Utah, Arizona and New México. If the Greater Sage Grouse becomes listed as an Endangered Species, then a lot of their habitat will be closed to human access. Don't let the Greater Sage Grouse become another Spotted Owl. What sets the sage grouse issue apart from other Endangered Species is the size of the habitat. To this day, nobody knows how many acres of public, state and private lands will be designated as "critical habitat" but the figure is staggering. Millions upon millions of sagebrush grassland habitat could be affected. Please leave your comments or concerns on this important issue concerning access to collecting sites on the ALAA Blog/Forum Page or send email to info@amlands.org.. Thank you for your time and effort. Press Release - September 13, 2012 - Congressman Mark Amodei (NV-2) criticizes BLM for using sage hen to block energy development. "Apparently responding to U.S. Interior Department Secretary Ken Salazar, Nevada Governor Brian Sandoval ... issued an executive order creating a new nine-member Greater Sage Grouse Advisory Committee to provide recommendations no later than July 31 of this year in an effort to prevent a federal Endangered Species Act listing which could 'have significant adverse effects' on Nevada's 'custom, culture and economy'." In July, the Obama Administration agreed to settlements with the Center for Biological Diversity and the WildEarth Guardians that covered petitions to list 779 species and 85 lawsuits and legal actions. 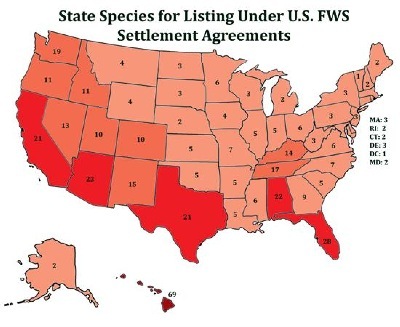 These settlements mandate that over 250 candidate species must be reviewed for final listing as either threatened or endangered under the ESA by 2016. As shown on the map below, the settlements could increase the number of species listed in all 50 states, a total increase of 16% by 2016. According to the Fish and Wildlife Service’s FY 2013 budget request, as part of the settlement, 88 new final and 47 proposed listing determinations are projected to be completed during this fiscal year. See how many new endangered species may be added in your state. These could have an impact on gaining access to your collecting sites. Note: California has more Threatened and endangered species listed than any other state.